THE RECORD SETTING Electric A’s from left, front, Taylee Wolfer, Ava Brown, Hailey Smith, Tayler Sample, Sarah Matt, Olivia Hopkins, Alli Hugen, Savannah Stalzer, Hanna Anderson, Emily Duncan, Nika Spaur; back, Logan Stalzer, Bradley Amante, Travis Sheffield, Logan Spaur, Chaz Fee, Bradley Yenger, Austin Stanley, Cole Folkerts and Tate Padilla. 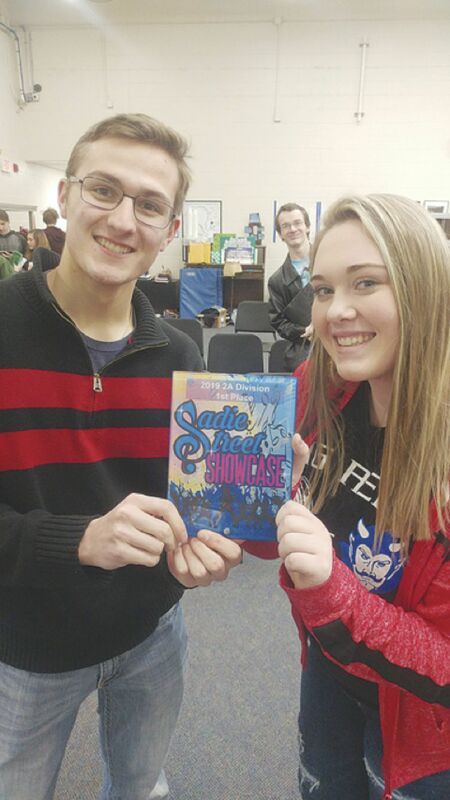 SENIORS BRADLEY Yenger and Alli Hugen hold up the first place plaque from the Sadie Street Showcase in Anamosa. THE ELECTRIC A’S band, from left, Ash Pickens, Eli Zanoni and Andrew Wright. The Albia Show Choir, newly dubbed “The Electric A’s” has had an active winter so far. Their usual trip to Keota for State Show Choir did not end ordinarily. The group took home straight Division I ratings -- the best a show choir can do at state contest. All three judges agreed the choir was worthy of a Superior rating. The Electric A’s have prepared a 12-minute long set of music. The standard order for any show choir is: 1. Opening Song (upbeat, grabs interest), 2. Transition Song (brings the tempo back down to prepare for ballad), 3. Ballad (full of emotion, shows off the choirs ability to harmonize), 4. Novelty Song (wows the audience with flair), and 5. Closing Song (combines a bit of technique from all the other songs and ends with a bang!). Including “The Middle” from Jimmy Eat World, and “You Say” by newly popular artist Lauren Daigle, the students had a lot of music to learn, said Director Alex Steines. Steines arranges all of the songs himself. “This allows me to fine tune each song to perfectly match our strengths. The entire goal is highlighting the students’ voices - it is about the kids and how we can make them sound the best,” he said. The students also performed for the first time at the Sadie Street Showcase in Anamosa. Anamosa High School is home to Albia alumni Caleb Haselhuhn who serves as the director of bands. The Electric A’s attended this competition as a learning experience. However, they came back with a nice first place in 2A trophy and many exciting ideas for next year. Steines has plans to change the rehearsal time of the group from the dreary 7 a.m. to an evening time slot. He also is looking to have a larger group, however, he plans to keep it highly selective. “It looks like a lot of fun, and it is, but not until the later stages. The first few months of rehearsal are hard work - but it all pays off,” he said. Not only is the choir going to lose leadership, they also graduate most of their back-up band. The band consists of Ash Pickens (12th), Andrew Wright (12th), and Eli Zanoni (9th). The band consistently receives positive comments on their dynamic contrast and sensitivity to not cover up the singers. The next opportunity to see this choir perform is at the Choir Extravaganza, Thursday, Feb. 21 in the A Gym at 7 p.m. The concert features all choirs from 5th-12th grade. For a shared concert between the ACHS Jazz Band and the Show Choir, mark your calendars for Swing Show April 5 and 6.